Hanoi (VNA) – Prime Minister Nguyen Xuan Phuc and a high-ranking delegation of Vietnam paid an official visit to Thailand from August 17-19 at the invitation of Prime Minister of the Kingdom of Thailand Prayut Chan-ocha. During the visit, the two sides issued a joint statement. Following is the full text of the joint statement. 1. His Excellency Mr. Nguyen Xuan Phuc, Prime Minister of the Socialist Republic of Vietnam, and his wife paid an official visit to Thailand from August 17-19, 2017 at the invitation of His Excellency General (Ret.) Prayut Chan-ocha, Prime Minister of the Kingdom of Thailand. 2. Prime Minister Phuc’s delegation included His Excellency Mai Tien Dung, Minister – Chairman of the Government Office; His Excellency Mr. Tran Tuan Anh, Minister of Industry and Trade; His Excellency Mr. Chu Ngoc Anh, Minister of Science and Technology; His Excellency Mr. Nguyen Xuan Cuong, Minister of Agriculture and Rural Development; His Excellency Mr. Truong Minh Tuan, Minister of Information and Communications, His Excellency Mr. Le Minh Hung, Governor of the State Bank of Vietnam, as well as other distinguished representatives from various ministries and agencies. 3. During the visit, Prime Minister Phuc was accorded a ceremonial welcome and had a bilateral meeting with Prime Minister Prayut, who hosted dinner in Prime Minister Phuc’s honour. Prime Minister Phuc paid courtesy calls on President of Legislative Committee; President of Privy Council General Prem Tinsulanonda and met with Chairman of Thailand – Vietnam Friendship Association, Mr. Prachuab Chaiyasan; CEO of leading Thai companies, and attended the opening ceremony of the “Vietnamese Week in Thailand” exhibition, held to promote Vietnamese products in Thailand. 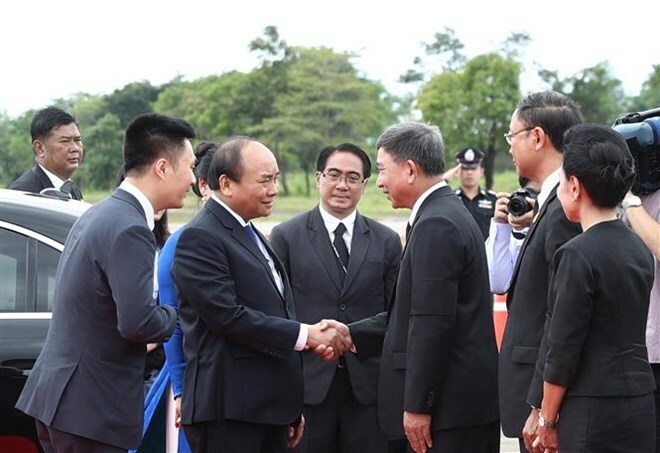 In Nakhorn Phanom, Prime Minister Phuc and his delegation visited President Ho Chi Minh’s Memorial Site, met with Vietnamese communities and attended the Meeting on Economic Connectivity, held to strengthen the investment and connectivity in Northeastern of Thailand. 5. Both Prime Ministers held wide-ranging discussions on bilateral, regional and international issues of mutual interest. Prime Minister Prayut and Prime Minister Phuc reviewed and expressed great satisfaction with the development of bilateral relations. The two Prime Ministers welcomed the substantial progress the two countries have made according to the Plan of Action Implementing the Thailand – Vietnam Strategic Partnership (2014 – 2018), and agreed to expand and deepen their cooperation in advancing their strategic partnership.